The Orange Order has defended its right to hold large parades in Scottish city centres. The Grand Orange Lodge of Scotland has faced criticism after a 12-year-old girl was injured in a disturbance during a parade in Glasgow on Saturday. But its grand secretary, Eddie Hyde, denied the parades were provocative and he claimed sectarianism was a "myth" that "doesn't exist" in Scotland. Eighteen people were arrested at the annual parade. It was attended by about 4,500 marchers and 4,000 spectators as the Orange Order celebrated the anniversary of the Battle of the Boyne. The 12-year-old girl was said to have been watching the parade when a fight broke out among a number people nearby. This resulted in the girl being hit by what is understood to have been a bottle. She was treated at Yorkhill Hospital for a head injury, but was later released. Her relative was also hit with the item and suffered a cut to her hand. The Grand Orange Lodge of Scotland has registered as an official backer of the "No" campaign ahead of the independence referendum on 18 September. It plans to hold a "British Together" rally for the union in Edinburgh five days before the vote. Some of those who took part in Saturday's parade were carrying pro-UK banners. Better Together, the official campaign against Scottish independence, has attempted to distance itself from the Orange Order, with a spokesman saying it "isn't part of our campaign and never will be". He insisted the Grand Orange Lodge was a "democratic, law abiding organisation" which "respects everyone's faith" and had a democratic right to "celebrate and promote our protestant culture". Mr Hyde, who said he did not foresee any problems with the Orange Order's march prior to the referendum, added: "The Orangeman's Day on the first Saturday in July is a celebration of the battle of 1690, when King William cemented civil and religious liberties for everybody in the UK and further afield. "They are only provocative to those who don't understand what we are in the streets for. They don't understand our institution and they don't take the time to learn about us." He said that accusations of sectarianism were a "myth", and later added: "Sectarianism doesn't exist in Scotland. Sectarianism exists in Helmand Province where our brave soldiers are dying to defend civil and religious liberties over there". Mr Hyde said the Grand Orange Lodge had recently met the Muslim Council of Scotland and Catholic organisations to explore ways of breaking down barriers between faiths. 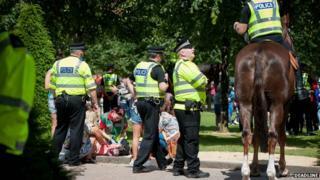 One of the major criticisms of the parades has been concerns over the amount of money it costs to police the event, with the authorities having to foot the full bill. But Mr Hyde said: "Over the last two or three years the Orange institution has worked endlessly with Police Scotland, Glasgow City Council and other local authorities to ensure that we are reducing the number of police by training stewards. "We have over 3,000 stewards trained at this moment in time which allows the police perhaps to reduce their numbers and concentrate on any disorder that may arise from the followers of our parade." He said parades were not allowed to march past Catholic chapels or other places of worship, and there were rules to prevent young children taking part.